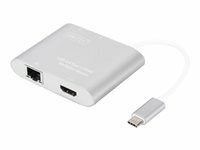 The USB multiport adaptor allows you to connect your laptop via the universal USB Type-C port to a second HDMI monitor with full 4K resolution. You also receive two additional USB 3.0 ports for connecting other peripheral devices to your computer. Also easily integrate your laptop into a high speed network due to its Gigabit Ethernet port. . Thanks to the easy plug-and-play configuration, you don't have to install drivers or change system settings.